Police say this man followed two teen girls around King of Prussia Mall in March. Pictured right is the vehicle he was possibly driving. Authorities are searching for a man they say followed two teenage girls around the King of Prussia Mall last month. 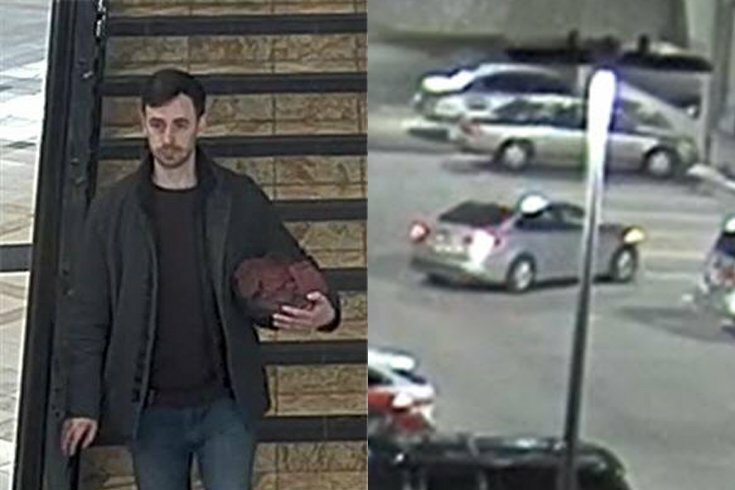 The two girls noticed the man while walking through the mall around 3 p.m. on March 10, according to the Upper Merion Township Police Department. The girls said they observed the man following them and at times getting close to them. The man was carrying a bike helmet with a cloth inside of it, the girls said. The man followed them for about 90 minutes before they notified their mother, who then contacted authorities, police said. The man wasn't there when police arrived at the mall. But when officers reviewed surveillance footage, they saw the man following the girls. At times, he appeared to point his bike helmet at the teens, according to police. Anyone with information on the unidentified man is asked to call the Upper Merion Township Police Department at 610-265-3232.